Sarethi Scion is a common Strength creature card. It is part of the Houses of Morrowind expansion. "There's only so much that honor can allow." "My family has endured enough!" 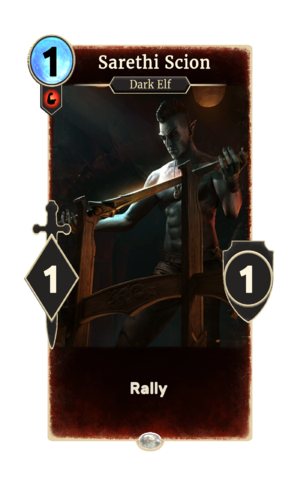 This card may depict Varvur Sarethi, who appeared in Morrowind as a young member of the noble Sarethi family. This page was last modified on 2 March 2019, at 00:05.